As a decentralized and distributed database, blockchain is changing the approach of enterprise apps to the design & development. We create distributed and autonomous solutions for businesses that make a real impact using blockchain as a core. “How our life would be much easier, if we have had a highly tamper-resistant and safe information storage database with all car fines comprised!” – have we thought one day. So we aimed to develop such a database on the base of Blockchain Technologies. Modern technologies permit us to recognize a car number automatically. So we can identify with high level of veracity the specific transport mean. Creating a record set with license numbers, time markings and fine details, we can build a comprehensive system for regulating all car fines. Operating principle via web interface, authorization restrictions and users accounting have become our challenges to meet. To meet our goals we make the following proof of concept. 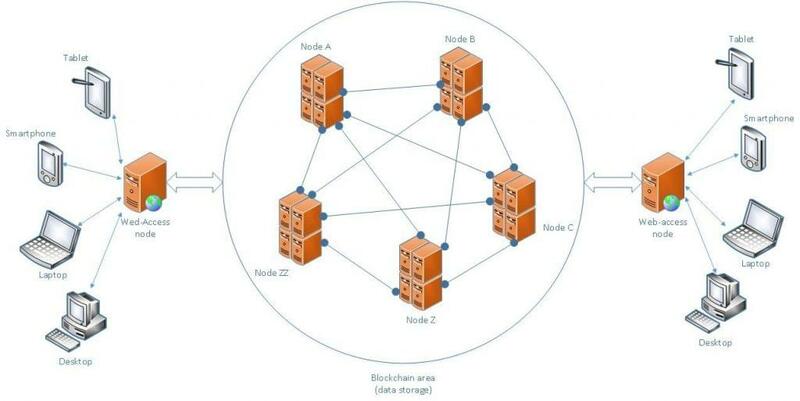 Solution architecture includes Blockchain Node, Web-Access Node and User Devices. Such structure permits us to address all crucial problems. contains all data and is connected with other solution nodes. can receive/transmit data and what’s more important – ensures highly qualitative User Interface. It also guarantees load balancing and operational continuity. are any gadgets providing an opportunity to work with web browser. They are the ones, end-users work with, while applying the solution. The solution is easy to use, but still has a lot of useful and substantial features. At the first stage database is filled with primary info on the base of existing registries of car fines. It’s also essential at the very beginning to create authorization rules for employees of regulatory institutions. Ensuring high level of security, we can apply different ways of user’s authentication: password, face recognition, etc. For identification of user’s access rights, we apply verification mechanism on the base of Blockchain Technology, thus preventing breaches and unauthorised access to the system. All information entered by the user is automatically saved in the system using Blockchain Technologies. Data as for a new license number, or car number change, or a new fine imposed, or paid fine will be securely kept in the System. Using different filters, the user can filter records and receive the specific information he needs. User can easily read, edit or delete any information. At the same time, all data once entered into the system is kept safe in the archive, and all changes are recorded. Latest news are easy to use! End-users and regulatory institutions benefit equally from applying Car Fines Distributed Database. Among key benefits are Distributed Data Storage and Authentic Information Reading. Blockchain Technologies allow us to guarantee a continuous access to the full scope of information stored. It’s performed due to safekeeping of all data in every node of the chain. In case some nodes become disabled, there is at least one node, where all data is saved. The system confirms an authenticity of all information stored. It’s achieved due to automatic verification of the specific information block presence in every node of the chain – once it’s read. If you have any questions as for our Case Study, please, contact Andrey Kovalev, using the form below. If you want to receive a consultation on Blockchain, please complete this form to contact one of our specialists.